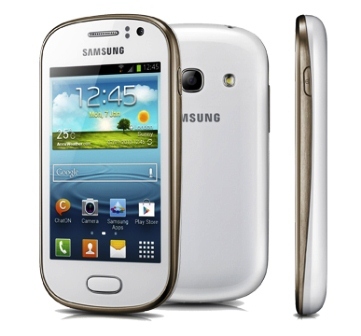 Another release from Samsung's mid player smartphones, the Samsung Galaxy Fame S6810. Featured with Near field communication (NFC) technology via S-Beam transferring (Featured first in Samsung Galaxy S3) which enables your device to share file using radio frequencies or WiFi signals, communication is also possible using NFC with S-Beam technology. Operated by Android Jelly Bean 4.1, Samsung Galaxy Fame can be compatible with almost all the app at GooglePlay store, and with the help of 1GHz single-core processor, everything will run fine and smooth, as Samsung processor can be faster than than what you expect, plus the 512MB RAM for multitasking and fast app switching. 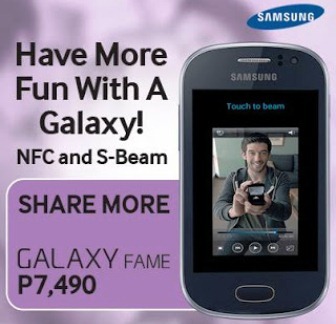 Galaxy Fame is also packed with fast internet connectivity support that ranges up to 7.2MBPS down-link. And lets not forget the final piece of a smartphone which is the camera, as Samsung Galaxy Fame S6810 has been equipped with 5MP auto-focus camera with LED flash, and we all know how Samsung works with camera. Priced at Php7,490 SRP and available now in the Philippines nationwide at Samsung Mobile Kiosk, authorized vendors, and online stores in PH. Overall, Samsung Galaxy Fame is classified as not so fast but not that bad smartphone. A smartphone for file sharing, mediocre camera, and affordable Samsung Phone. If you happen to have this phone, kindly share your experience with us. Thanks!